Many people in the Oldham district, particularly those connected with hospital work, will hear with deep regret the death of Nurse Donovan, formerly connected with the Oldham Poor Law Institution. Her death occurred under tragic circumstances. On Sunday she had prepared the little Catholic Chapel for service, and at night was observed to be in a fainting condition. She was put to bed, but passed away on Monday morning 3rd April 1916 about ten o’clock, having contracted Cerebo-Spinal Fever. This was her 38th birthday. Bridget Donovan was born on 3rd April 1878 at Curragh Lane, Tullogher, Ireland. Her father was a Gentleman’s Tutor and she was educated at Tullogher National School. She started her three-year nurse’s training at the Oldham Union Infirmary on 6th March 1910 after which she studied Midwifery and District Nursing for three months, was a staff nurse for 9 months, and then became a sister. Whilst nursing she lived in the Nurse’s Home on Rochdale Road. She applied for war service in 1915 and was accepted into the Queen Alexandra’s Imperial Military Nursing Service Reserve on 12th November 1915. From Oldham she went to work at the Alexandra Military Hospital, Cosham, near Portsmouth having had no experience of enteric or typhoid fever. Here she treated some of the most serious army cases and her devotion to duty made her very popular. It was at Cosham that she died from cerebo-spinal fever on 3rd April 1916. It is with deep regret that a report has been received from the Military Hospital that Nurse B. Donovan, Queen Alexandra’s Imperial Military Nursing Service, died on the 3rd inst. I beg you will express this expression of sincere sympathy. The only relative present was her sister Johanna Barratt. 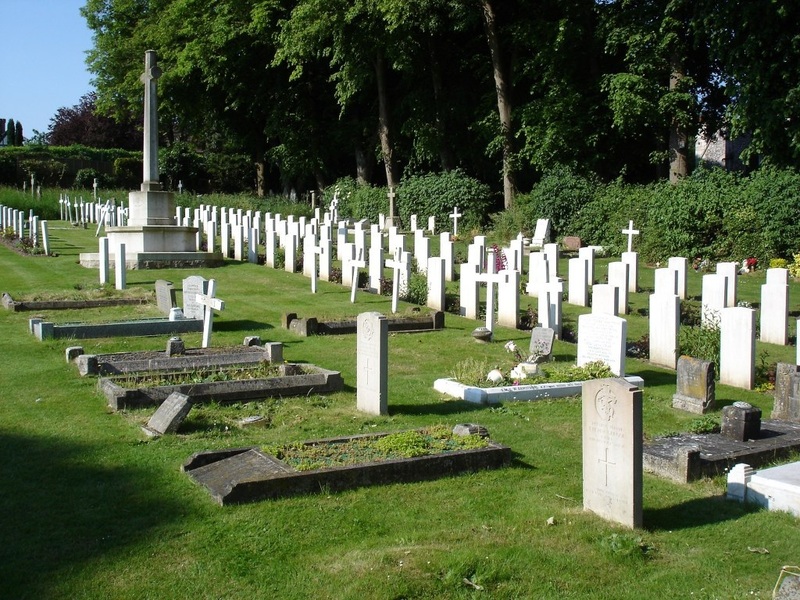 Christchurch Cemetery, Portsdown – Commonwealth War Graves Commission. Bridget Donovan’s grave is cared for by the Commonwealth War Graves Commission and is located at 54C, row A. Written by Sandra Ratcliffe, Oldham Local Studies and Archives. On 3rd April 2016 (the centenary of Nurse Donovan’s death) the Queen Alexandra Royal Army Nursing Corps (the successor to QAIMNS) will holds its Corps Service at Christ Church Portsdown. Members of QARANC who lost their lives in WW1, in particular Nurse Donovan, will be remembered and honoured. All are welcome.